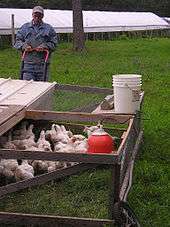 Pastured poultry is a sustainable agriculture technique that calls for the raising of laying chickens, meat chickens (broilers), and/or turkeys on pasture, as opposed to indoor confinement. Humane treatment, the perceived health benefits of pastured poultry, and superior texture and flavor, are causing an increase in demand for such products. Herman Beck-Chenoweth reintroduced the free-range system that was the most popular way to raise poultry in the U.S. from the 1930s through the 1960s. The system allows birds to range freely during the day and be safely sequestered on secure skid houses over night. The addition of a guard animal, such as an Komondor or Anatolian Shepherd dog, controls predators. 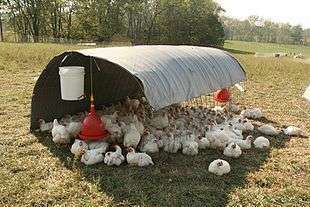 In the modern American free-range poultry production system, birds are much less crowded and freer to practice normal bird behaviour than in any other pasture-based system.